Don’t eat me: I’m poisonous! Some of the most beautiful colour patterns in nature are in fact, warnings. The yellow and black colouration of the wasp is a classic example. Another appealing combination of colours to our eyes, is black and red. These so-called, aposematic colourations are screaming out to would-be predators, saying watch out, I am poisonous! You will not like the taste of me! I might even kill you! No surprise then that soldiers uniforms used to adopt these colours; think of the Queen’s guards outside of Buckingham Palace in London, with their red coats, black trousers and black bearskin caps. Perhaps they are saying, don’t mess with us! 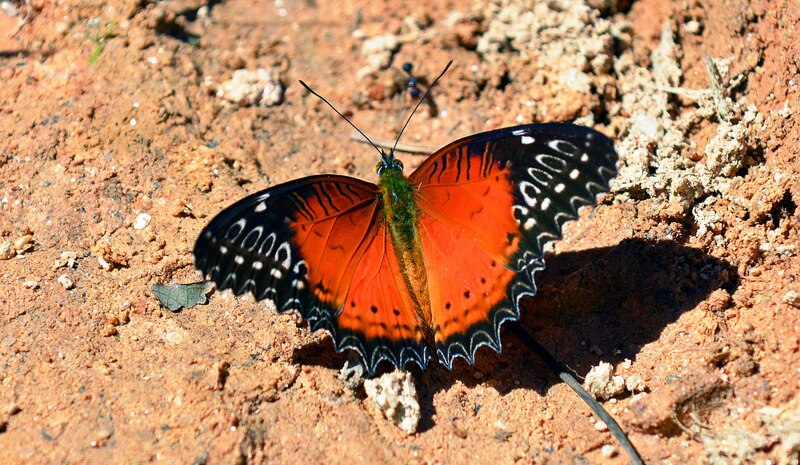 Another, slightly more fragile animal, which uses the same colours to say ‘back off’ is the gorgeous Red Lacewing (Cethosia bilbis). This tropical Asian species is relatively common in countries such as Thailand, and throughout south-east Asia. 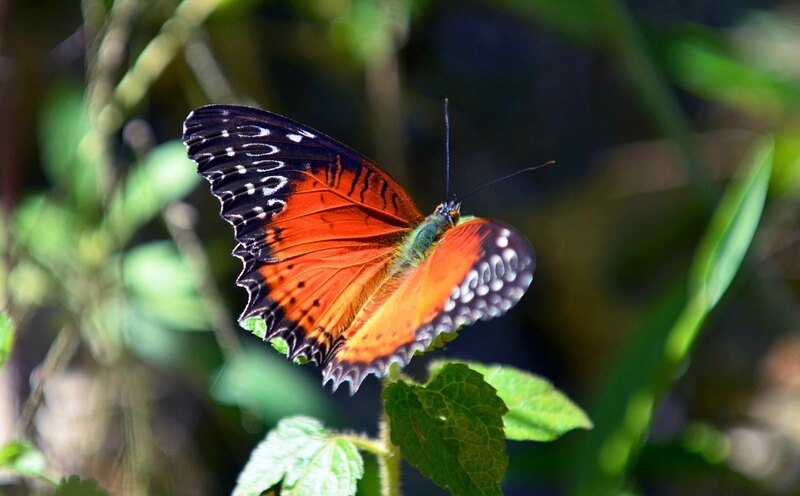 There are a number of different species in the genus Cethosia, all of which are a beautiful red or orange-red and black colour (1), although the females are less strikingly red. There are also different subspecies. 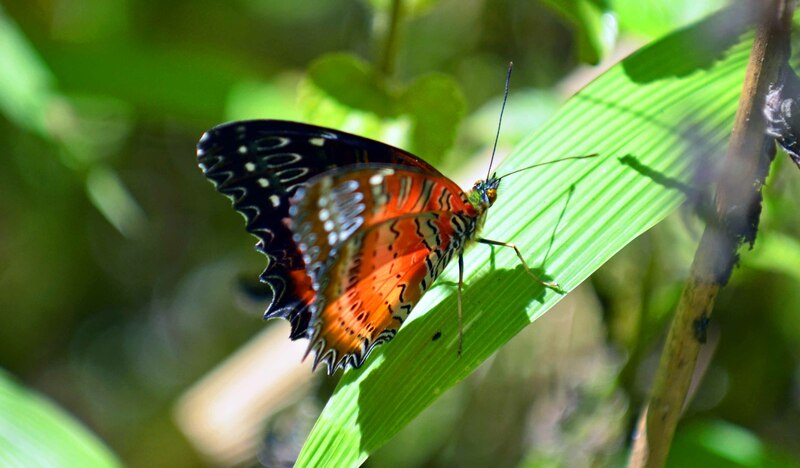 The male Red Lacewing (Cethosia bilbis bilbis) shown above (and in profile below) was photographed on Doi Suthep mountain, above Chiang Mai city in northern Thailand. The underside is less of a warning and is more muted. It is perhaps the ability to flash the red upperwings at predators such as birds and lizards, that is the main protective mechanism. These butterflies are poisonous because they contain cyanide! The can synthesise cyanide from chemicals called glucosides, or cyanogenic glycosides, which when broken down release cyanide. They obtain the glucosides from feeding on their host plants (e.g. passion flowers and vines: Passifolia spp.) at the caterpillar stage. 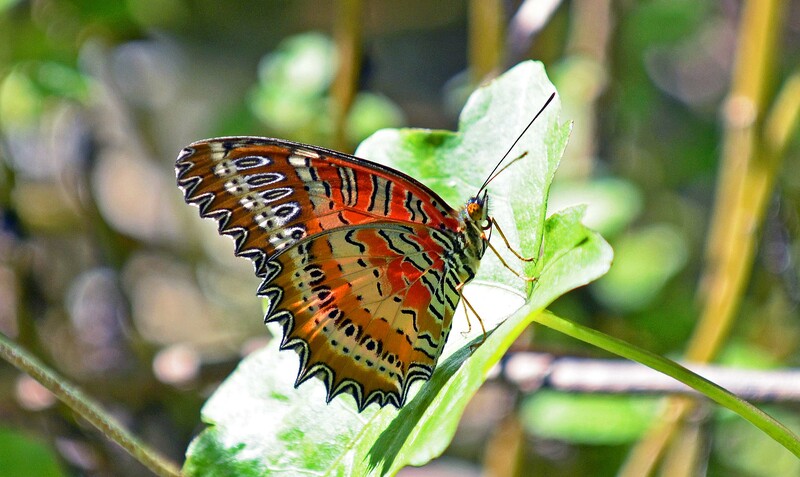 The adults of Cethosia biblis visit flowers, such as those of Lantana camara, to feed on nectar. 1) Pisuth Ek-Amnuay (2006). Butterflies of Thailand. Previous Previous post: The Tawny mime is a mimic! It’s always nice to see Lacewings. Apart from birds, I also enjoy butterflies a lot. Ray Cannon's nature notes Don’t eat me: I’m poisonous!